Club Penguin Cheats by Mimo777 Club Penguin Cheats by Mimo777: Rookie Stamp Now Available! OMG!! I can't believe it!! I thought we couldn't find Rookie! Now it's confirmed! Or is it yet ANOTHER April Fools' Joke? Dance with the box and the purple propeller hat. Don't use the past propeller hats- they don't work. You'll be hidden inside the box, but the hat will be hovering! Im sure the comment tracker will be coming soon! Woohoo! Found rookie in hot chocolate, got his bg and stamp! I got a tip for all..
Finding rookie is not that easy, trackers lie, but not mimo's tracker. It works. Rookie is wearing a hawaaian shirt with his usual glasses and hat. What are the servers that rookie goes on a lot? I will find him this time! I just know it! And yes, a lot of the trackers do lie. But not Mimo's! I found him on Beanbag! :D His background has his face right where the pin goes, so I be they will switch it to the other side like they did with the Gary Background. Hmmm. Well good luck with the hunt everyone! YEAH!! i just met him today!! he is awesome!!! ROOKIE ROCKS! I had been waiting on Zipline for hours and then got disconnected. I randomly tried the top Portuguese server and there he was in the box dimension! 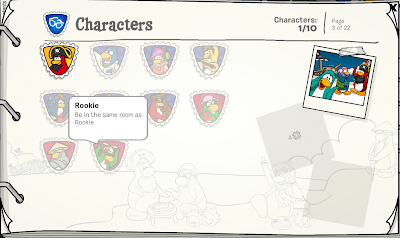 When I tried the English servers, CP suggested one of the safe servers (Ice something), which I had never used before, and there Rookie was again! Glad you found Rookie! I like his background it's cool!